Fans observe small objects interacting on a distant square. 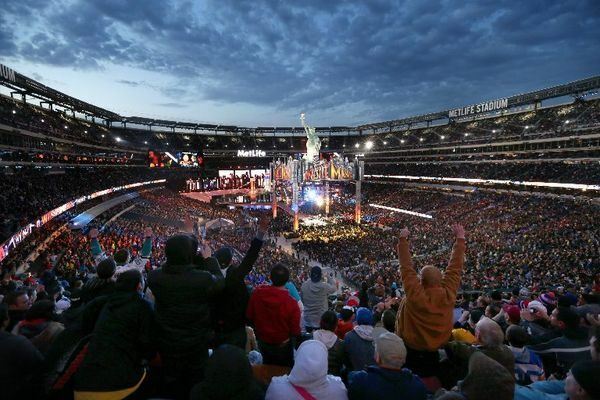 World Wrestling Entertainment (WWE) hosts its annual WrestleMania extravaganza tonight at the Met Life Stadium in New Jersey York, where the mast majority of 80,000 fans will watch the event on enormous digital screens. A record-setting crowd will periodically squint in the direction of the ring, where WWE superstars will resemble tiny ants crawling around a bluish postage stamp. A small minority fans who re-mortgaged their homes to afford ringside tickets will be treated to a thrilling event, while the other 77,000 will be jealous and resentful. Fans in the upper deck of the stadium will be provided with oxygen masks to stave off altitude sickness. On the plus side, they will not hear Michael Cole’s commentary.